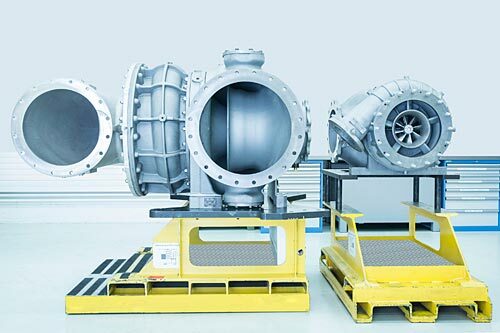 ABB Turbocharging will launch a new frame size for its two-stage turbocharging solution, Power2 800-M. With this addition to the portfolio, to be launched mid-2017, the benefits of high pressure ratios, increased turbocharging efficiency and fuel savings will be extended to a wider scope of advanced medium-speed engine configurations. The new frame size marks a milestone in the continued development of the Power2 platform, following unveiling of the second generation at Nor-Shipping 2015 and selection for the world’s most efficient four-stroke diesel engine. The new frame size, Power2 845-M, applicable to an increased range of ship propulsion solutions, will open up efficiency and operational benefits to a greater spectrum of vessel types. These may include OSVs, drill and semi-submersible vessels, RoPax, ferries, as well as medium-sized tankers, container ships and bulk carriers, for main engines, DE and auxiliary engines. Power2 800-M was designed to set new standards in turbocharging performance. The innovative design achieves an overall turbocharging efficiency of more than 75%, some 10% higher than conventional single-stage models. For vessel owners, this can translate into yearly six-figure savings in fuel as well as significant cuts in emissions – up to 60% lower NOx emissions. With engine room space at a premium on modern tonnage, careful attention was given to optimizing the layout with dedicated components for two-stage turbocharging application, resulting in a 20% smaller footprint than a solution based on conventional single-stage components. Ensuring straightforward service and maintenance while minimizing downtime was another design criteria. Power2 800-M comes with an extractable cartridge for ease of service, reducing overhaul time by 30%. “Based on our experience, lower service costs and maximizing availability are crucial for operators in optimizing total cost of ownership,” explains Marco Burgwal. Power2 800-M will first be commercially applied on a state-of-the-art icebreaker to serve the Yamal LNG project in the Russian Arctic. Fuel efficiency and reliability were the two major deciding factors in the design specification. Other key considerations were operational flexibility as well as performance in extreme environmental conditions as the vessel will operate in temperatures down to -50° C.
Other forthcoming marine applications of Power2 800-M include a Danish-built purse seiner/trawler to operate in the North Atlantic, North Sea, and Norwegian waters, and a car and passenger ferry to be built in Finland for a Danish operator. Further Power2 800-M units are also on order for marine and stationary power applications.